In the early 1970’s DoodleArt posters were very popular in Canada. I remember colouring the jungle poster and the very cool rock and roll poster with my brothers when I was a kid. 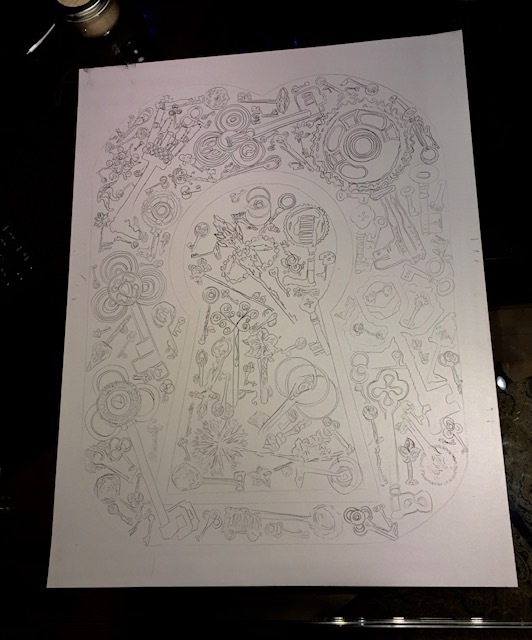 As I continue my quest for making keys using beloved crafts from my childhood I thought it only fitting that I attempt to make my own DoodleArt poster. First I drew a “keyhole” on a large piece of tracing paper and then I began tracing drawings of keys I had made earlier in this 5000 key project. I kept adding more keys until I was happy with the way the poster looked. After that I used carbon paper to trace the keys onto the poster paper. I forgot to make a tracking key for the tracing paper and at one point it moved off the poster; I mostly got the tracing paper back in the correct place but not quite. Luckily I am making just this one key DoodleArt inspired poster and am not mass producing them for sale — perhaps the lack of perfection just adds to the charm! I used a lovely spectrum noir artliner pen to add black ink to the poster. Then the colouring fun began! Here are a series of photos of the poster process followed by documentation of the first 71 keys I coloured. I did get mixed up a few times in my count but sorted the mix-up out when I was taking pictures of the keys. The carbon paper after the tracing was finished; I love the delicate look of this! The poster prior to adding the ink. Some completed keys - including the mini-milestone Key 1500!